The Centre for Living with Dying serves children, adolescents, and adults who are dealing with grief and loss. The Centre for Living with Dying is certified to provide law enforcement training, nurse training, clergy and mental health professional education and a variety of support groups, including survivors of suicide, survivors of homicide, breast cancer support, gay and lesbian grief support, parental grief and neo-natal grief. For more information on any Centre for Living with Dying programs or counseling groups, please call (408) 243-0222. "My experience at the Center for Living with Dying helped me get through the year of my husband's illness and passing and beyond. I found a caring, professional counselor who made, overall, a safe place for me. I've learned to be gentle with myself, to acknowledge I can tackle practical matters my partner had handled. 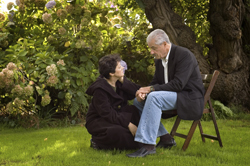 I was not dismissed when I shared the comforting sense that my husband was and is still with me. I was helped with solid tools and an intangible but valuable aura of support that helped me, and in turn, my children, to progress through an extremely challenging time." "The support I have found at Bill Wilson Center is helping me deal with my loss." "Couples therapy has helped me to communicate with my husband a lot better." "Your CISM debriefing saved my life. I was thinking of killing myself after the death of two children in a car fire because I couldn't save them, and now you have saved me." "I was so impressed with your agency and the CISM training. Your words heal people and your agency provides a wonderful service to the entire community." "I am committed to being a compassionate dispatcher again. Thank you for giving me my heart back." The Centre for Living with Dying is supported by Kaiser Permanente Northern California Community Benefit Programs.